Lincoln County Community Rights and its allied organization Citizens for a Healthy County, are proud to present: “Drift: A Community Seeking Justice” a short film created by U of O students about the Gold Beach accident involving herbicide spray of a neighborhood. This event will be held August 27th at 6:30pm in the local PUD Public Meeting Room 2129 North Coast Hwy 101 Newport. This is a fund raiser event for Citizens for a Healthy County. This group has filed a local initiative to ban Aerial spraying in Lincoln County. This event will have several speakers that will discuss the harm inflicted on the community of Gold Beach in October 2013 and what we can do about it. 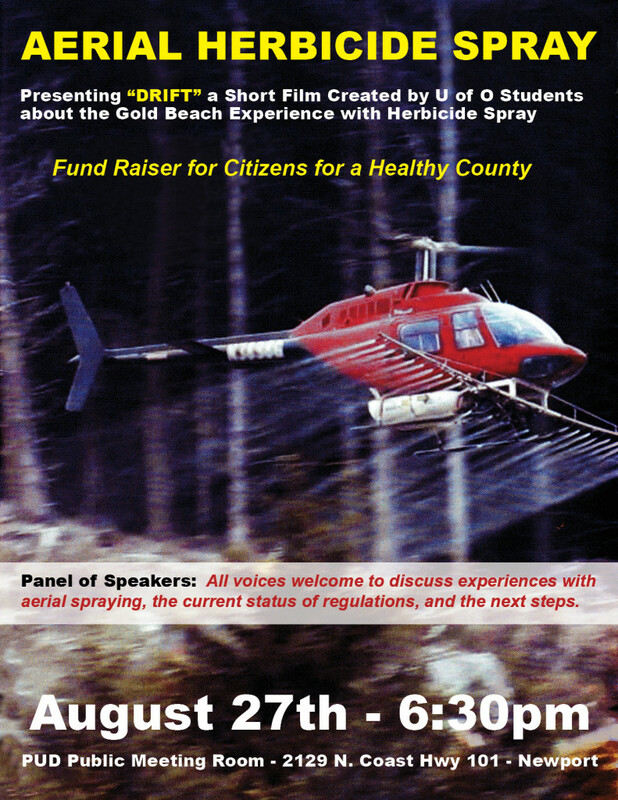 The public will also be invited to discuss how aerial pesticide spraying has affected the lives of your family, friends and neighbors. Come join us and learn how citizens are using local lawmaking to exercise our right against involuntary poisoning by industrial logging practices. Industrial logging cuts ten times more timber in Oregon’s coast range than the Forest Service and douses every clear cut with poisonous chemicals. These practices threaten our community’s health by contaminating our wildlife, fisheries and publicly owned water. Published by admin, in LCCR.